Hycails Medical cellulose is a plant based ultrapure cellulose with an extracellular matrix type structure. The material is biocompatible and is designed to have an open pore structure with optimal distribution of pore size in order to give the material excellent bioactive properties. The material can be used as a tissue scaffold, as a cell support matrix or to harvest bacteria and cells. The material is an ideal matrix for attachment, invasion, growth and division of living cells. The material can be formulated or optimized to meet individual application requirements and it can be pretreated with drugs for pharmaceutical research. The material can be sterilized in an autoclave. -In vivo collection of human cells from surgical patients. 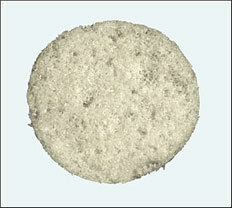 -As a subcutaneous implant in mice to study drug effects on angiogenesis. -Studies on connective tissue formation in rats. -Studies on bone formation in rats. -Harvesting of cells from cell cultures.